This is the most affordable Night Vision device in the world, period! Patented lever activated power supply substitutes expensive electronics, and the reduced manufacturing cost is passed on to the customers. Ideal for camping, hiking and all outdoor activities, when you do not want to depend on batteries. 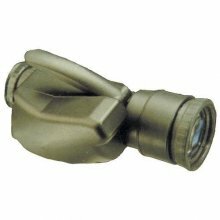 The included powerful Infra Red Illuminator allows observation in complete darkness. No batteries are required.